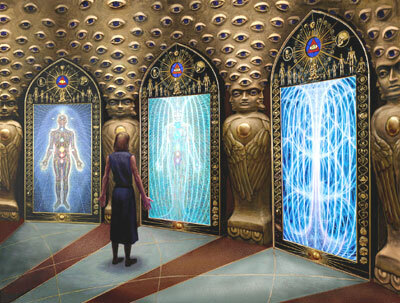 "The Chapel of Sacred Mirrors will provide a permanent public exhibition of Alex Grey's most outstanding and widely appreciated works of transformative art,fostering a vision of the fully awakened human potential." The Sacred Mirrors series is a totally unique work of contemporary sacred art created by Alex Grey. This installation of 21 framed images, consisting of 19 paintings and two etched mirrors, examines the anatomy of body, mind and spirit in rich detail. Each painting presents a life-sized figure facing viewers and inviting them to mirror the images, creating a sense of seeing into oneself. The life-sized representations of the human body, portraying its physical and energetic systems, are both rigorously precise and vividly visionary. 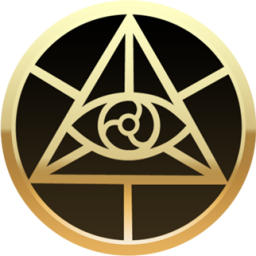 The Sacred Mirrors dramatically reveal the miracle of life's evolutionary complexity, the unity of human experience across all racial, class and gender divides, and the astonishing vistas of possibility inherent in human consciousness. Alex Grey has combined ancient wisdom, anatomical accuracy and post-modern eclecticism to produce elegant, universally accessible, eternally relevant and resonant symbols. These awe-inspiring images emerged from courageous explorations of the visionary state that Alex had with his wife, artist Allyson Grey. Allyson, who initiated and named the project, worked along side Alex on the frames and consulted on much of the painting which Alex accomplished over a period of ten years with relentless artistic discipline and painstaking work. Alex's early forays into dark, transgressive performance art, his youthful obsessions with death and decay, including a long stint working in a morgue, also deeply inform his later, mature, luminous work. The Sacred Mirrors have a power and authenticity that can only spring from a soul who has plunged into the darker realms and come out whole. In his introduction to Sacred Mirrors: The Visionary Art of Alex Grey, Carlo McCormick compares Grey's creative journey to a shaman who travels at great peril to the lower realms to emerge with healing teachings for the tribe. Grey's work, in Ken Wilber's words "...reminds us of our own higher possibilities, our own deepest nature, our own most profound ground, which we are all invited to rediscover." This carries on the lineage of sacred art as diverse as shamanic X-ray art, the artwork of 12th century abbess, Hildegard of Bingen, Michelangelo, Bosch, Blake, and Buddhist Thangka painters. Alex, a professor of anatomy in the Fine Arts Department at NYU for ten years and one-time professional medical illustrator, informs his paintings with an almost hyper-realistic accuracy. This combination of perennial wisdom and scientific exactitude, marks a most fruitful marriage of ancient spiritual and modern analytic worldviews. Many people have inquired where Grey's works may be seen and have urged Alex and Allyson to build a Chapel of Sacred Mirrors where the entire series and a number of related pieces could be permanently exhibited. The Chapel of Sacred Mirrors would be a space for contemplation, meditation, events and ceremonies, a vital cultural institution like the Rothko Chapel in Houston, Frederick Franck's Pacem in Terris in upstate New York, or Noguchi's museum in Long Island City. This chapel must offer a setting that optimizes the aesthetic appreciation and transformative potential of the work.